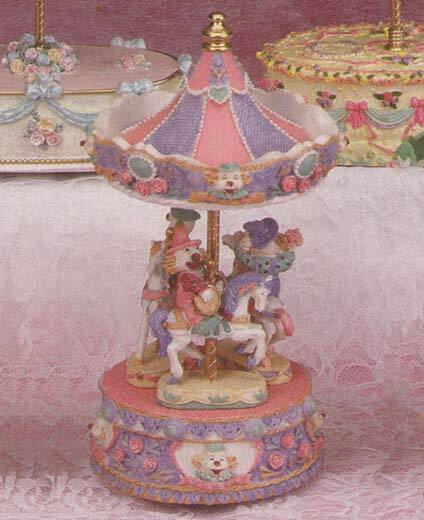 Welcome, we have here some adorable musical carousels. Please enjoy your visit and thank you for stopping by. 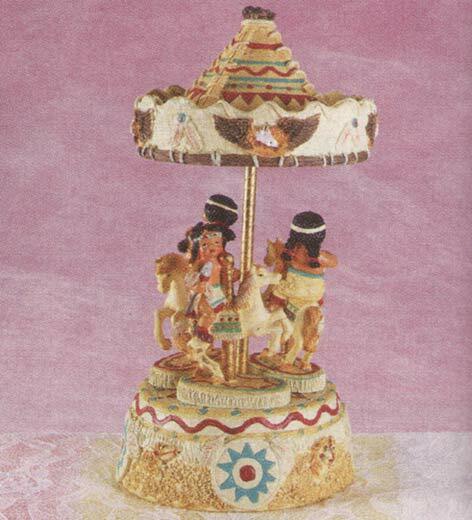 Four native american kids enjoy a wild ride on this southwestern style carousel. Hand painted in elaborate detail. Alabastrite 6" diameter x 9 1/2" high. Tune is Ten Little Indians. 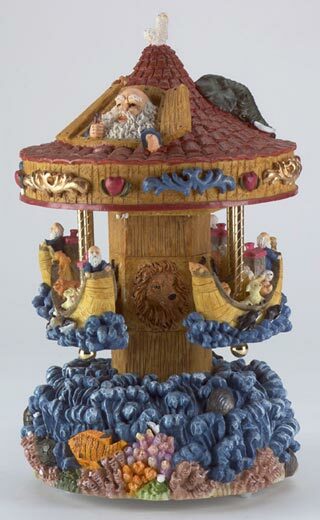 Every one's come to the carnival to catch the next flight on "merry go round". 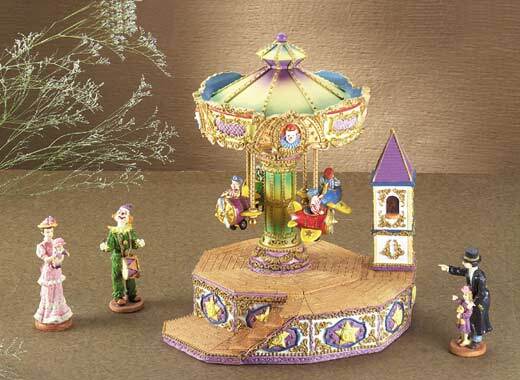 This set includes separate figurines of mother and child, father and child, clown with drum. Musical, tune: Happy days are here again. 12" x 10" 12 1/2" high. Alabastrite. 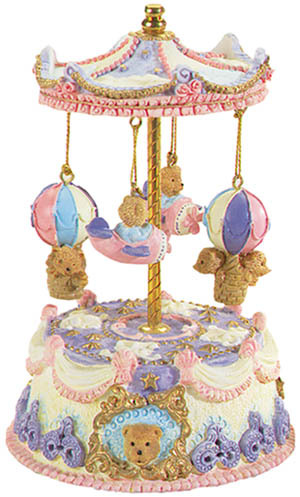 A teddy bear birthday cake is the base for this festival of color and fun. 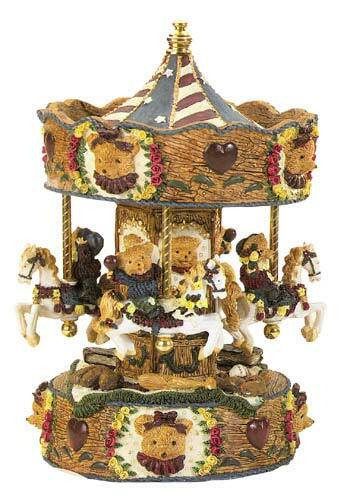 A carousel of teddy bears in planes and hot air balloon circle to the tune of "Up Up and away". 4" base diameter x 7" high. 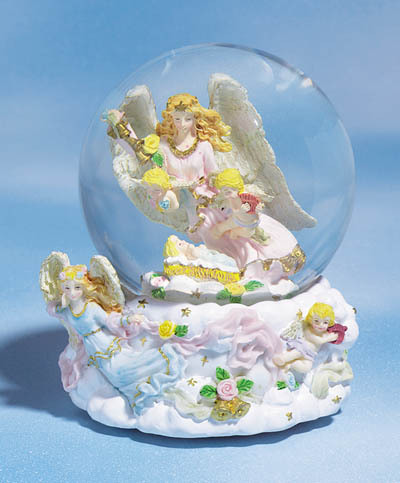 Ribbons, roses and cherubs decorate a heavenly merry-go-round of angel musicians circling to the tune of "Wind beneath my wings". Alabastrite, 5 7/8" diameter x 10" high. Just clownin' around on the carousel, 3 clowns take a ride on the carousel in a bright and cheery calliope of colors sure to bring a smile. 5 1/2" x 9 1/2" high. Tune: Send in the clowns. 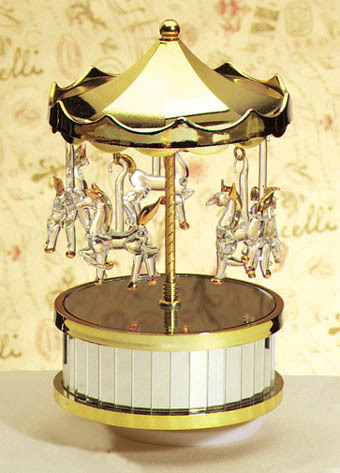 The centerpiece in any collection of carousels, this masterpiece represents the highest achievement in authenticity and craftmaship. 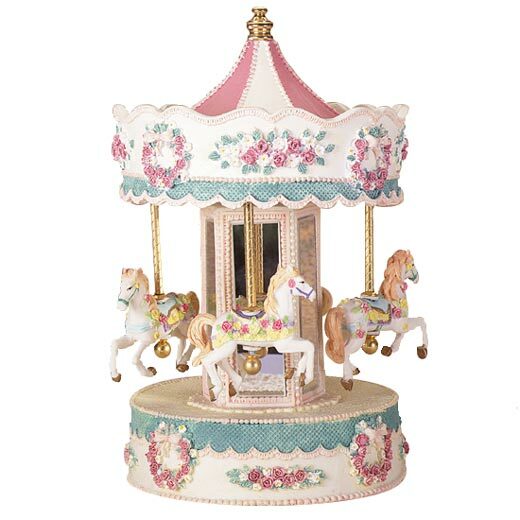 A festive finely detailed merry-go-round with alabastrite canopy and mirrored centered column. 9 7/8" high. Tune: Carousel Waltz. 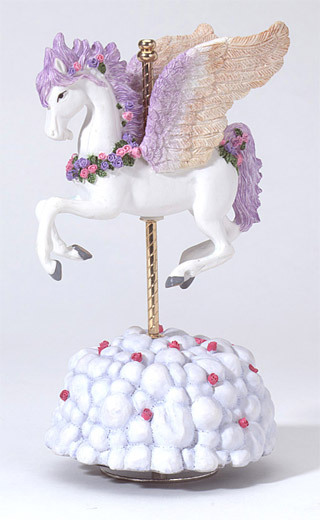 A musical Pegasus rides above rose strewn clouds, his glittering wings reaching high. He spins to the tune : Music of the night (Phantom of the opera). 4 1/4" x 8" high. 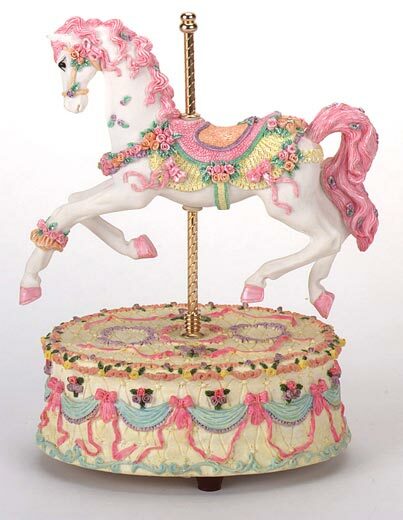 Long-legged and elegant, this musical carousel horse is a treat for the eyes and ears. 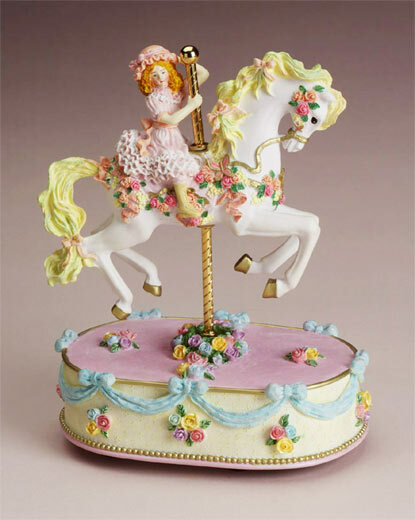 Opulently decorated with ribbons and roses, all details intricately sculpted, the horse rotates around the gleaming brass pole. 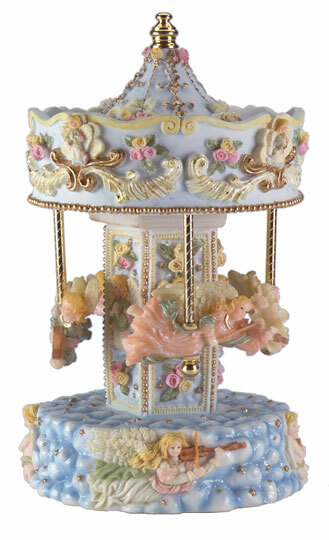 Alabastrite, tune: Carousel waltz, 6 7/8" 4 1/2" x 8 3/8" high. 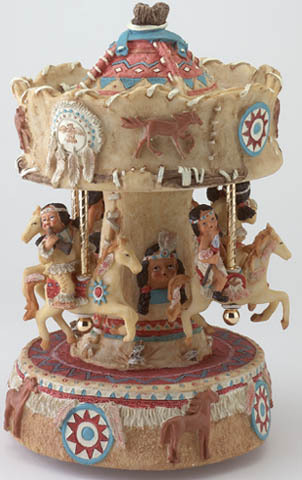 A trully unique carousel featuring three native american children and southwestern design. 4 1/2" base diameter x 9 1/2" high. Tune: Ten little indians. 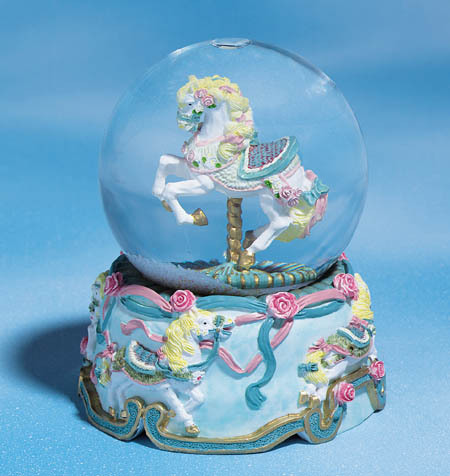 An intricate motif of carousel horses, ribbons and roses makes this water globe a real find for the collectors. 4 1/2" base diameter x 5 3/8" high. Tune: Carousel Waltz.